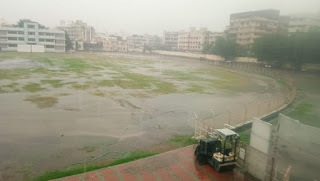 Ajitsinh Cricket pavilion (Cricket Bungalow) will be celebrating its Diamond Jubilee, and Jamnagar is doing all to celebrate 100th anniversary of this landmark monument to Indian cricket. ADC Mukesh Pandya announced that All India Inter School (Under-16) Cricket tournament is being organized from 16-10 to 22-10, the event is named after legendary Test Cricket Player from Jamnagar, Vinu mankad. Around 35 team will be participating in the event, apart from the main stadium, various school grounds are also reserved for the event.